Using wrought iron decor items such as arbors, trellis', topiaries, obelisks, and fences, in your gardens and landscaping gives your flowers and vines the added support they need to climb on, in order to grow properly and look good. 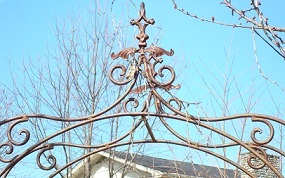 Many of the photos of wrought iron decor items on this page are from my own gardens, but you will see links under the photos of items that are for sale on the store. 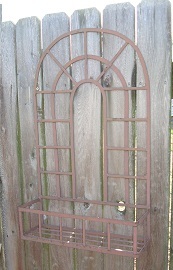 I have collected various types of wrought iron decor over the last several years. 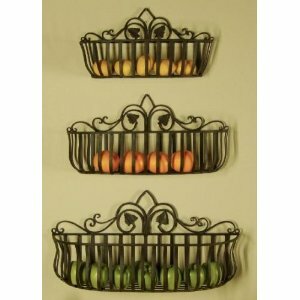 First, I started collecting for my gardens then I started adding wrought iron accessories inside my home too. When you take a look at my gardens you can see lots of items such as garden benches, shephards hooks, planters, arbors, fence panels, roosters, and more that I have in my gardens and landscape. I let my rust because I like the aged look outside in my gardens. I also use decorative iron and wood items on my privacy fence. This breaks up the long span of fencing and adds interest. 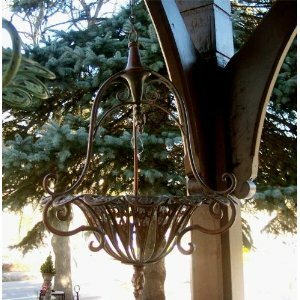 I have added a Wrought Iron Decor Store to this page that includes lots of items for both inside your home and outside in your gardens and landscaping. Some items are interchangable. You will also see some of my own wrought iron items in photos on this page and through out the website on garden and landscape pages. The photo above on the right is the top of an arbor in my backyard. I really love the old world look of the details of these items when the flowers are dormant and I can see the entire piece. Keep reading below for more photos and details about the wrought iron decor items I have in my own yard. I am deliberately showing showing photos of these items when the flowers are dormant, so the iron shows up better. 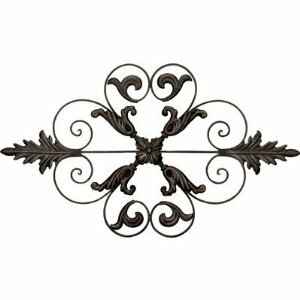 CHECK OUT THE BEAUTIFUL WROUGHT IRON DECOR ITEMS FOR YOUR HOME AND GARDEN This is only a small sample of the wrought iron items available, click on any item to enter the store, then do a search for any type of wrought item you are looking for , such as arbors, etc. 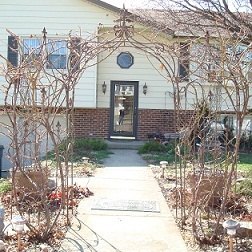 The photo on the right shows my wrought iron arbor with a matching wrought iron trellis on each side. This is at the beginning of my front walk. This entire structure is covered in Blaze Climbing Roses (red) that blooms all summer long. (1 rose is planted at the base of each wrought iron trellis). In this photo the roses are just starting to get new growth for the new spring season. In a few weeks they will be green and completely covering the stucture. The use of a trellis on each side of the arbor gives the illusion of an opened gate. This also gives some privacy fromt the street which I enjoy. The combination of Wrought Iron Decor and natural elements such as lots of tree stumps and stones used in my Landscape help to make my Winter Landscape alot more interesting when the plants are dormant for the season. . The wrought iron arbor next to the brick in this photo on the left is located on my patio at the back of the house. A beautiful Joseph's coat climbing rose loves it! We always attach trellis's and wrought iron decor to the brick for better stability. This wall planter photo on the right is one of 3 that I have hanging on my privacy fence in my Secret Garden The Rooster topped weathervane was a gift, and I use it in my garden to support vines. I love to display rooster decor in my landscape, and use rooster wrought iron planters, and rooster statues too. Each year in the early spring when I bring out all of my garden decor I make changes in the way I display items. This way old stuff is new again. Flea Market finds are great in the garden. And so are items discovered at Peddlers Malls That is where we found a great wrought iron and wooden garden bench That we restored last fall. It will be placed back in our front yard this year. 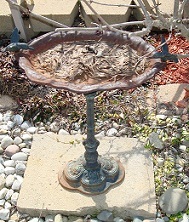 This iron birdbath is filled with leaves from a nearby elderberry bush. I left it out all winter. Some items are stored during winter months that are more fragile. The great thing about the wrought iron decor is that I'm ok with the aged look. We have a rustic fence made out of barnwood that surrounds our raised bed garden And a big Barnwood Pergola That we built that supports a Wisteria. So, the aged wrought iron looks great with the aged wood. We are going to add a barnwood garden shed to the backyard this year so that will be another addition I will give details on how to do as soon as I have them. Something new to look forward to! I plan on decorating the garden shed with old items and wrought iron decor too. I hang iron keys and a horse shoe on this weathered post. The first half of the post is surrounded with chicken wire so vine can grow upward. I also have a wrought iron planter hanging on this post in warm months. 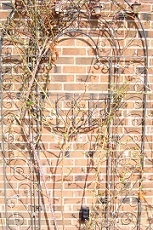 This wrought iron trellis supports hyacinth bean vine. I have a pair of these on the sunny end of the house. The vine loves full sun. I sell the seeds in the Garden section of the Rented Mule Store The concrete Mule is in one of our front gardens where we removed a over grown Pine Tree A few years ago. 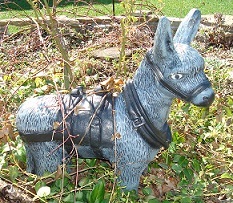 I am going to place 2 planters with tall iron oeblisks in the garden on either side behind the mule statue this year. I will have climbing vine growing over the obelisks and sedum and other vines growing in the planters. Topiaries and obelisks are similiar to each other. I use topiaries too. I hope you have gotten some good ideas on ways to use wrought iron decor in your landscape. Make sure to check out the huge selection of decorative and functional items made from wrought iron that are available in our Wrought iron Decor Store You can also shop for beautiful Iron Garden Benches in our Rented Mule Store too. 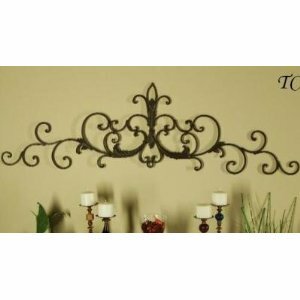 As you look over other pages of this site you should notice more wrought iron items that are not shown on this page. I have a large collection. Which includes more wrought iron furniture, a garden bench, fence pieces and more. Thanks and I hope you enjoy decorating your home and gardens this year with durable and beautiful wrought iron decor. Our taste in home decor changes from time to time. Sometimes when we decide to redecorate or update a room we decide on a different look to a space. Several years ago I decided to start using wrought iron decor inside my home too. I had moved and was tired of my "same ole stuff". So, when I started shopping for wall decor, candle holders and other decorative accessories I was drawn to iron items instead of resin, porcelain, wood or other materials. Now iron home decor items have become very popular. I think I have one framed print hanging on a wall in my foyer. And even it is surrounded by wall plaques made of metal. I use wall shelves, candle sticks, wall grills, tie backs, curtain rods, wall art, sconces, bird cages, and more inside my home. I have long ago tired of the traditional framed prints, and no longer even own any of them. So, My point here is, wrought iron decor works inside your home as well as it works outside in the garden. You can even bring pieces inside your home, during winter months, for a new look indoors. Try using a trellis or wall grill with fabric or a silk vine woven thru it over a headboard for a great look. I have one similiar to the one available below. I have done this in one of my guest bedrooms that has antique furniture in it. The room is refered to as our "garden room", because we have florals, antiques, and iron in this room that gets great sunlight. It is a very special room. Create you own special space inside your home, using wrought iron decor.